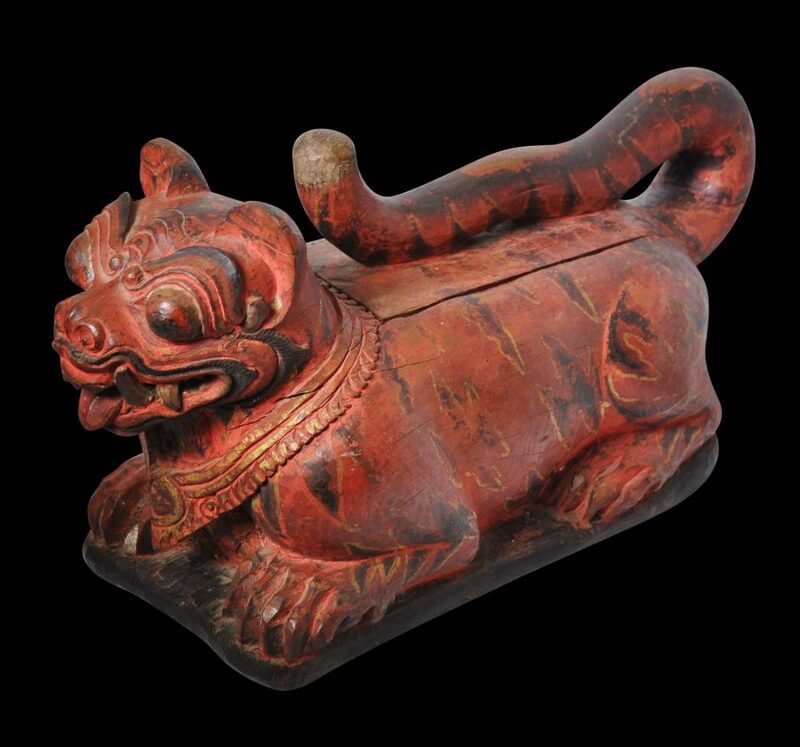 This box, which has been carved form a single piece of wood, might have served either as a betel box or as a ritual storage or offering box (sajen). 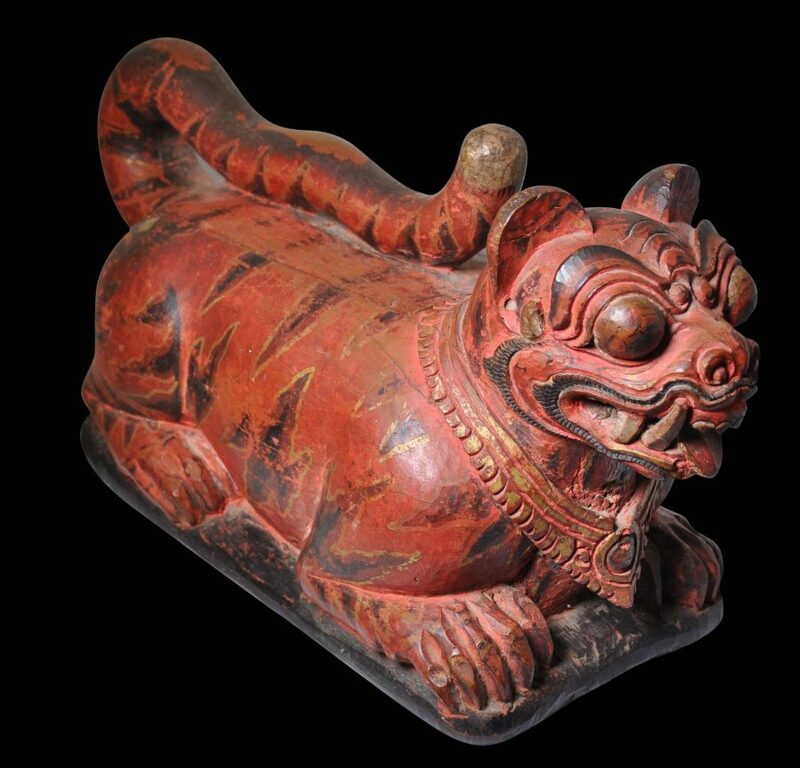 It is in the form of a tiger, and is well carved with strong features. 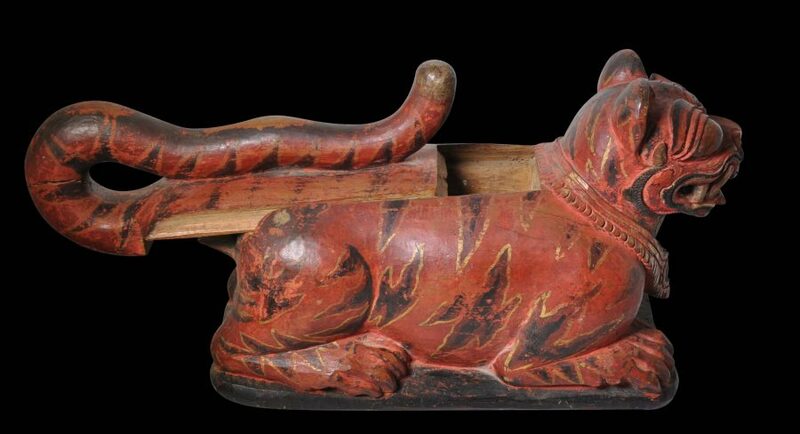 The tiger’s face with its bulging eyes is particularly dynamic and expressive. The patina and style suggest a dating some time in the nineteenth century. A sliding cover on the back pulls out to reveal a hollowed cavity inside. 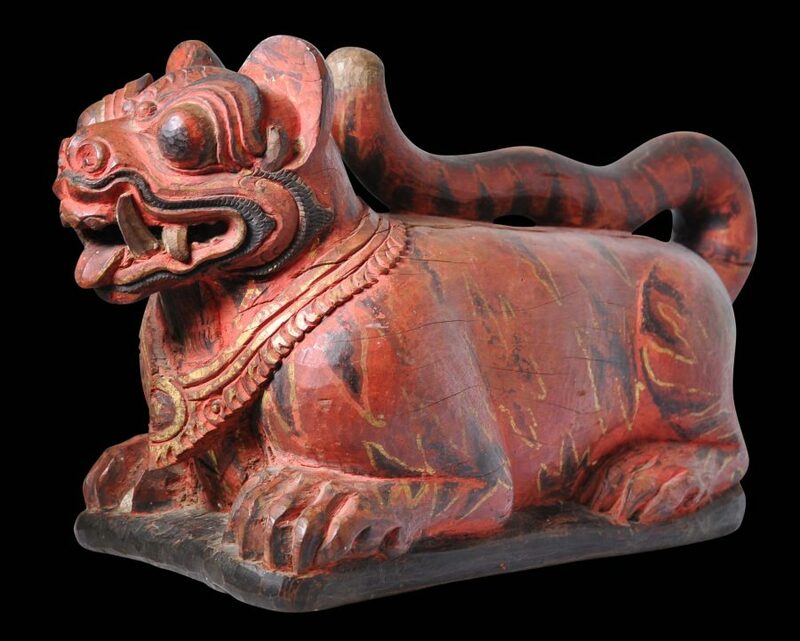 Such images were used as storage boxes for religious palm leaf manuscripts (lontar) and, possibly in other instances, other items that were to be taken to the temple or to ceremonies to serve as offerings. 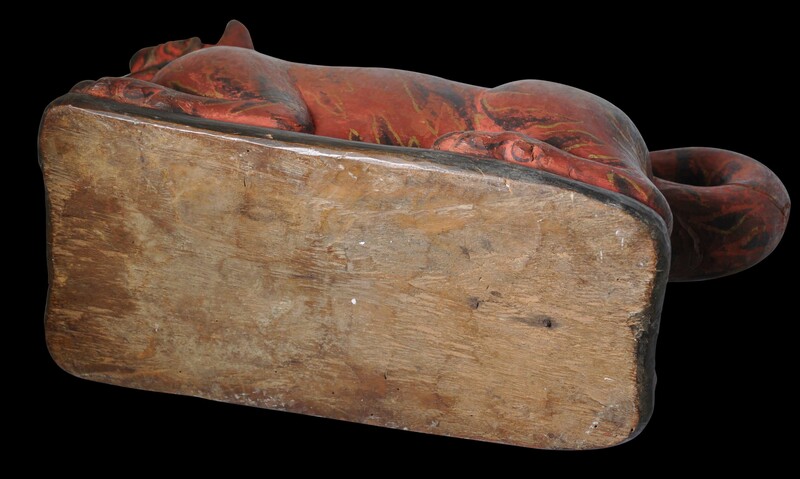 Such items were kept in the covered cavity in the tiger’s back. 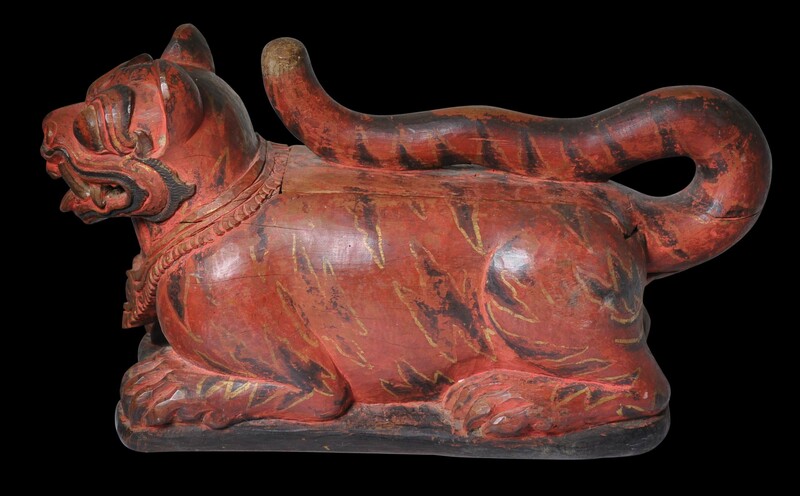 The tiger is shown seated on its haunches; its claws are large and powerful. It has a thick, strong tail which curls up over its back, and which usefully acts as a handle for the cover that makes up its back. When used as an offering box, such boxes usually were stored within wooden structures in larger temples and taken out during ceremonies. They were brought out from the temple for ritual processions when they and other ritual objects were carried to the sea or river for ‘cleansing’, a process known as melaspas. The box retains its original colouring and pigments. The predominant colour is orange-red with black stripes within gold borders. 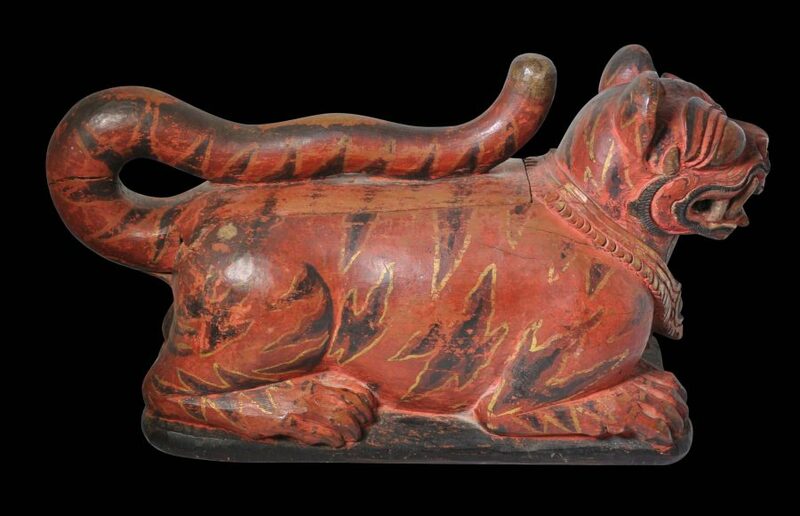 The item was acquired in Scotland and most probably was part of an old collection. It appears to have been in the UK for many decades. It is in fine condition with no significant losses and only some age and wear-related paint loss, and light and stable shrinkage-related cracking.